I convey that emotional essence to an observable platform by way of a painter’s lexicon – color, form, space, texture, line, movement - and finesse those elements much like seeking the right piece to complete a puzzle. As I fill a blank canvas with an onslaught of arbitrary paint strokes, splashes, drips and mark-making, that essence comes to the fore as the image begins to, in a sense, speak to me -- at turns beguiling and confronting me. An exchange of sorts unfolds, as I get immersed in a rhythmic blur of advance and retreat, flow and stagnation, defiance and submission, discord and collaboration. I search for that moment of sensing synchronicity between how I feel and what has been revealed on the canvas. Her abstract paintings have been included in regional, national and international juried exhibits, and she was featured in Acrylic Artist Magazine Winter 2016 edition. 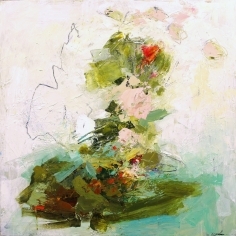 Since 2016, Conn’s work has been presented in three solo shows and two invitational group exhibitions, including the prestigious Colorado Women in Abstraction exhibition at the Center for Visual Art in Denver, Colorado. Her work -- represented by Leopold Gallery in Kansas City, MO -- was selected by show host, Tamara Day, to be shown on a new DIY Network show "Bargain Mansions" that premiered Nov. 15, 2017. 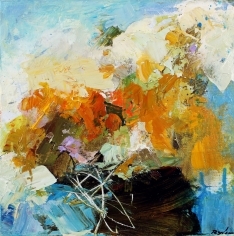 .Conn is currently represented by galleries in Atlanta, Georgia; Des Moines, Iowa and Kansas City, Missouri. shown on a DIY Network show "Bargain Mansions," premiering Nov. 15, 2017. Artist Spotlight — City of Brighton Eye for Art Program for the week of Nov. 9, 2015; The Denver Post Hub article.